"We design and produce sheet metal components for complex and elaborate projects. 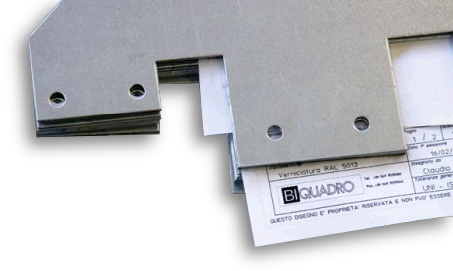 We set ourselves as a partner able to find solutions to the problems of our customers"
Biquadro Srl, founded on 2007 by the engineers Alessandro Boni and Rodolfo Brutti, is specialized in designing and manufacturing of sheet metal components for third parties. Our factory is equipped with the most up-to-date machinery as automated cutting systems produced by Salvagnini Group SPA and bending systems. Biquadro has two productive headquarters in Bagnoli di Sopra and more than 40 employees. During these years the company has developed capabilities in order to support the customer with complex projects, designing ad-hoc solutions and realizing special manufactories.